So many questions, including is this video the work of YouTuber Ed Bassmaster? The worst shoveler in Philadelphia. 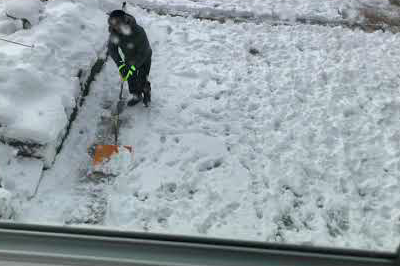 If you woke up Thursday morning with a sore back, it's best if you don't pat yourself on it for shoveling the snow that fell during yesterday's nor'easter. The best shoveler in March is the sun, pro tip. The worst shoveler is this guy in Philadelphia, who in all probability is YouTube prankster Ed Bassmaster, posing as his weirdo alter-ego Skippy. Actually, there are some really confusing aspects to the video above, which appears to show Skippy having a horrible time shoveling the driveway (or yard, why?) of a man who just paid him $20 to do the job. Apart from the inept shoveling, what's going on here? If Bassmaster (as Skippy) is the crazy shoveler, then who's the guy filming and narrating this? Did Bassmaster do this prank with an accomplice? Is it still funny, in that case? Did he talk to the guy afterward and tell him he's a YouTuber? What if this is someone else pranking Bassmaster because they know he's a prankster? Did Bassmaster play both roles and just do some nifty editing? How do you account for the crying baby? Isn't that more important than the shoveler? There are just so many questions here. Did the shoveler keep the $20? Will Bassmaster make $20 or more in YouTube revenue for this? All we can say for certain is that's not how you shovel snow.